Much like my good Friend Joey Tribbiani, one of my favorite foods is sandwiches. I love finding/being introduced to new shoppes, cafes, and eateries that can make a mean panini, wrap, sub, hoggie, gyro, whatever you wanna call it. Now I do have my favorites (buffalo chicken, tuna, anything with avocado) but now that I’m starting this segment I promise I’ll attempt to be more adventurous. 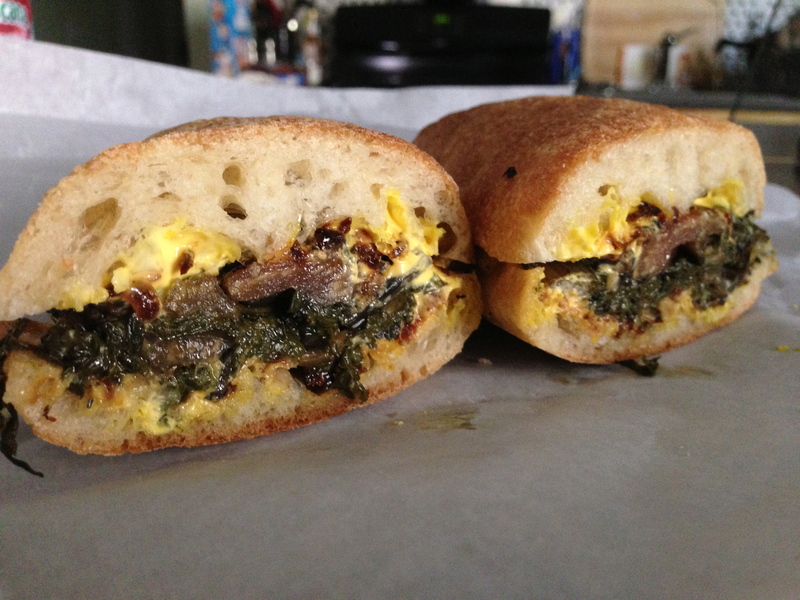 Root in Allston is all about fresh, local, simple food made with good-quality ingredients. The menu is complete with Big Bites (burger, sandwiches, veggie plate), Small Bites, Salads, Fresh Juices, and house-made infused (non-alcoholic) drinks. You can build your own black bean and quinoa burger, and can turn any of their salads into a wrap which is what I did with the Curried Quinoa Salad. This sandwich is hearty and healthy, and has a bit of a spice kick courtesy of the curry. 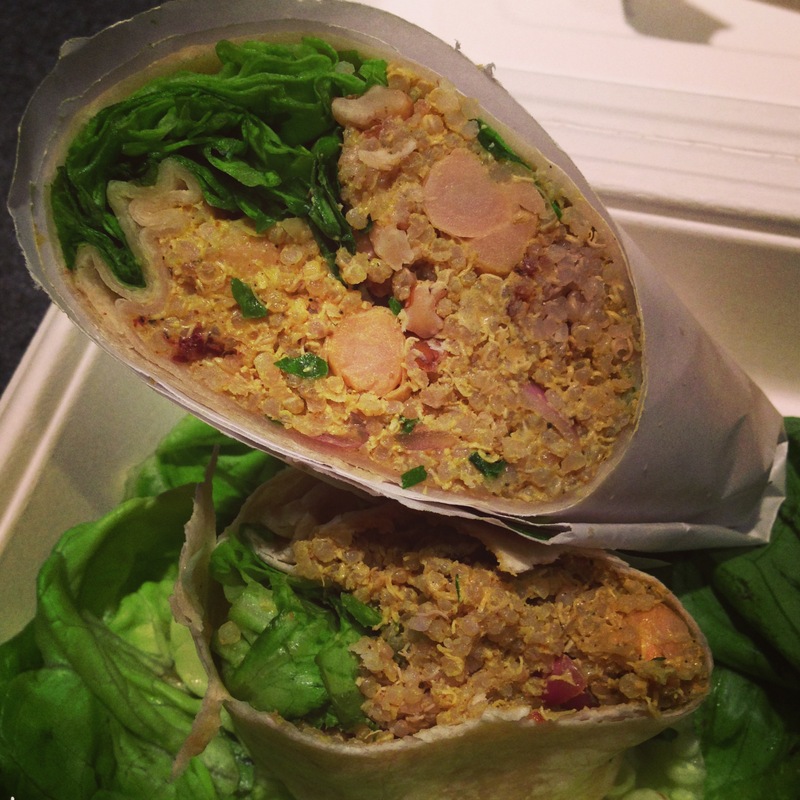 There’s just enough creamy dressing to hold the quinoa together, but the sandwich never gets wet or drippy. A wrap well done! 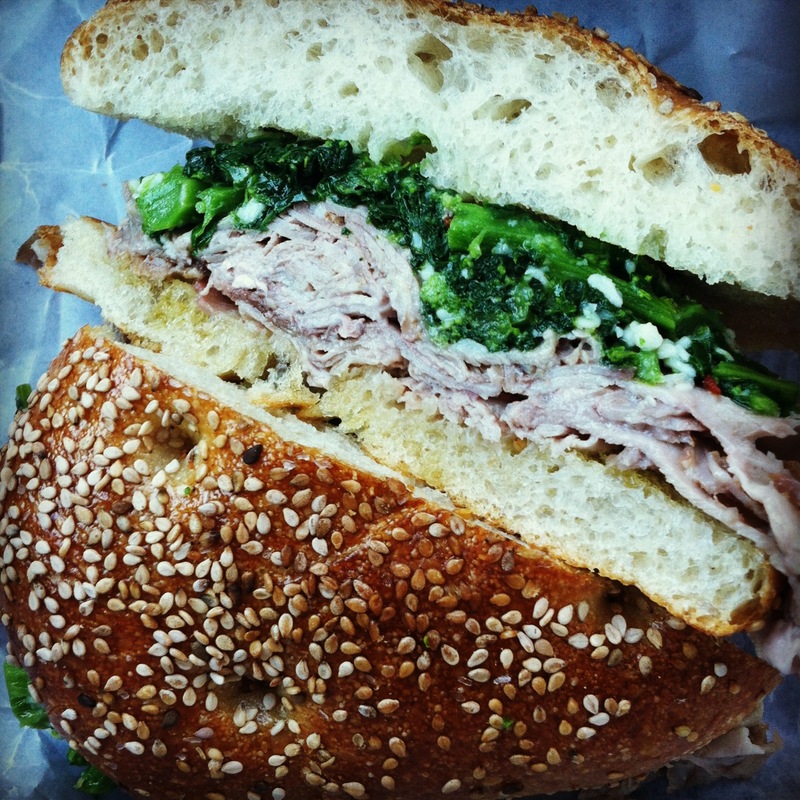 Shaved pork is piled with broccoli rabe and stuffed between a crunchy sesame seed roll. The description says is comes with provolone but I honestly didn’t notice the cheese, and was too hungry to open up the sandwich to find it. I typically don’t love broccoli rabe since it’s known to be bitter but I didn’t mind it with the pork. The roll is hearty and quite crunchy! This sandwich is only sold on Saturdays so make note if you’re a pork lover. Exclusive to Saturdays is also the Pork Fennel: slow-roasted pork, pickled fennel, roasted garlic, sesame seed roll. This hearty veggie sandwich is served on soft ciabatta bread (which I prefer to a crunchier roll – they always cut my mouth!). 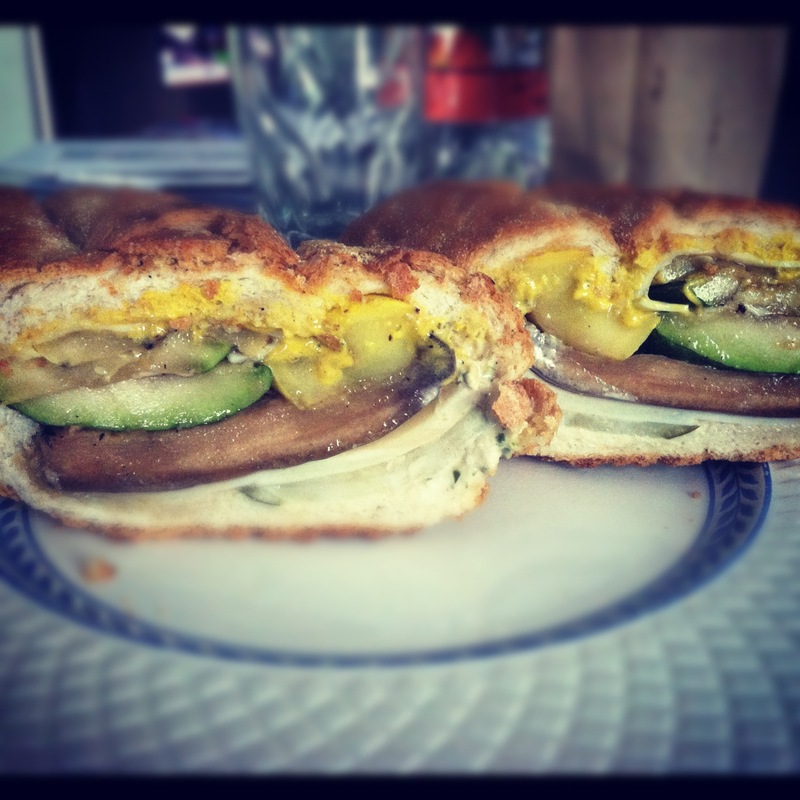 There’s not much to this sandwich ingredients wise, but each one packs a punch. The flavor of the saffron yogurt, slightly crispy shallots, the substance of the swiss chard, and the ciabatta is really an excellent combination. This is one of 3 veggie sandwich options at Cutty’s and even without trying the others I think this is probably the best! This new sandwich shop offers soups, salads, sandwiches, and a few breakfast items. I’m usually a turkey, tuna, or veggie kind of girl, but the specialty sandwiches mainly offered pork, ham, and red meats. There were a couple veggie options I was eyeing, but I wanted to eat outside of my comfort zone and landed on the roast beef. YUM! A perfect amount of dressing soaked into the brioche bun, the shallots added great texture & crisp, and the serving was a perfect size. 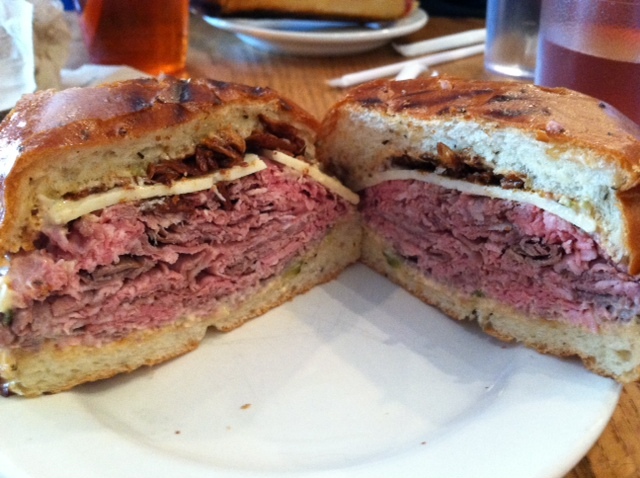 Cutty’s sure is “Home of the Skillfully Crafted Sandwich”. I decided to make the trip from Brighton to Cambridge this Sunday to try the highly acclaimed All Star Sandwich Bar. With weekend traffic and driving through Head of the Charles crowds, it took about 1.5 hours to get there, order take out, and drive back home. 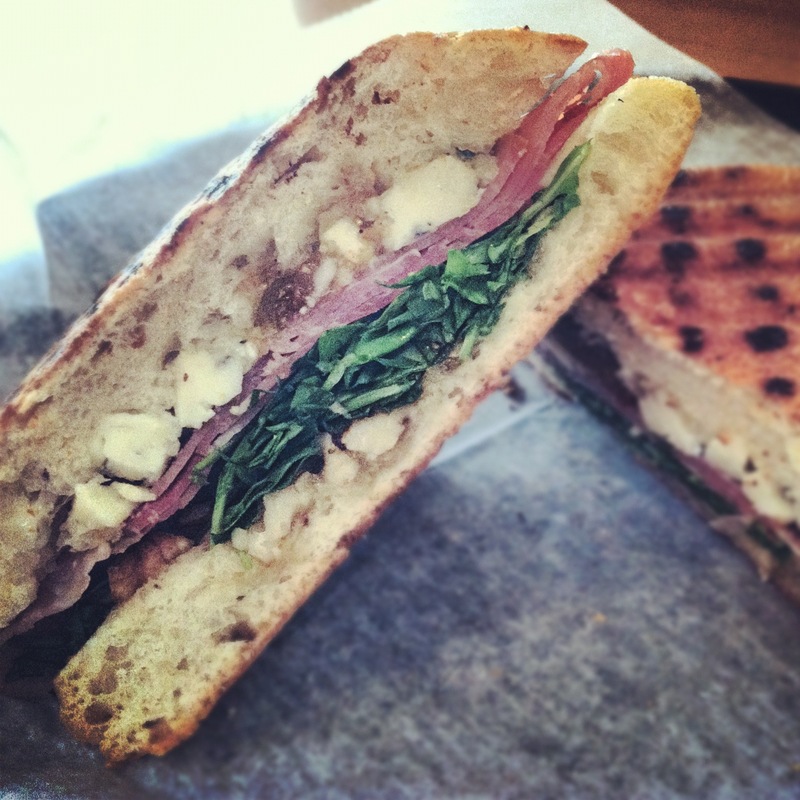 Was the sandwich worth the hassle? Yes and no! I ordered the Veggie Cubano sans Portobello and I feel I eliminated most of the substance of this sandwich as the vegetable to bread ratio was a bit off for me. There was too much bread for my liking but the veggies and condiments were right on. Matt really enjoyed the Tuna Melt and loved the sweet pickle relish it came with. I’d definitely go back, specifically for their famous Beef on Weck: house roasted beef with real au jus and extra hot horseradish on a Kimmelweck Bun (warm & thin). Their other 12 specialty sandwiches are creative and enticing, mostly offering meats and turkey but with a few veggie options. 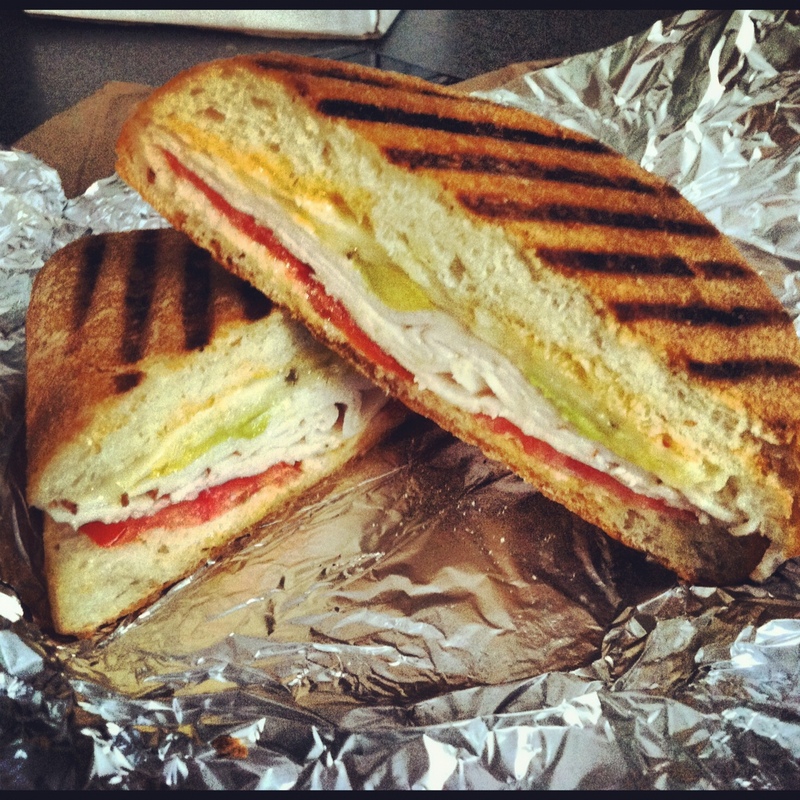 I’ve only ever tried the paninis at Temptations and you seriously can’t go wrong. This particular option is full of thinly sliced prosciutto, has a nice smear of walnut-fig spread, and just enough of the potent gorgonzola. Perfect portion size, super tasty… a great option for prosciutto lovers! Each panini I’ve ever had at Temptations is grilled just enough that the sandwich is warm and stays together nicely without having items fall out of the bread. You can’t tell from this photo, but this was my first Temptations panini that couldn’t keep it together! At times that can be a deal breaker, but this particular sandwich is so packed full of goodies that I didn’t care. Perhaps we got a weak piece of bread (there was a hole in my half), or maybe it didn’t stay intact b/c there wasn’t a thick piece of melted cheese to hold everything in… either way, this panini is a new favorite! My go-to at Temptations is usually the tuna sandwich you see below, but their paninis are so excellent that I forced myself to try another. As I am part of the Boston Food Bloggers group I received $15 in Foodler bucks from Foodler.com in exchange for a blog post about the ordering experience. Foodler.com is fairly easy to use and has dozens of eateries on board from cafes to bars to ice cream shops to popular sushi restaurants; you can order online and pick up your food or choose the delivery option. The site allows you to view places near you using a Map view which is quite helpful. Once I saw Temptations Cafe I was sold. 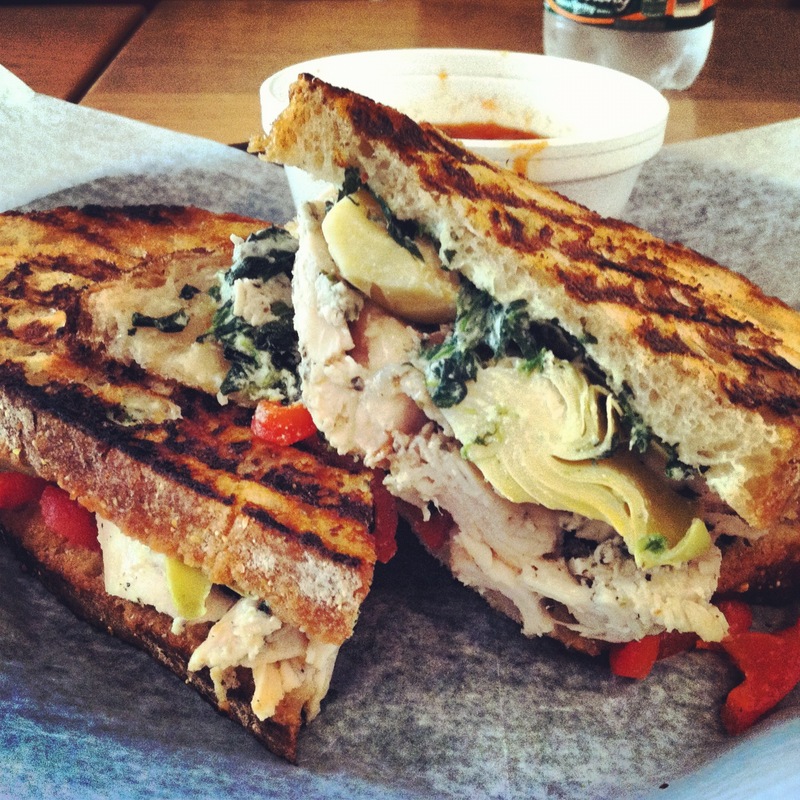 Their paninis are always packed with prime ingredients and a ton of flavor. The best part is they are grilled perfectly & stay together so nicely! The only small issue there was with Foodler.com is that I paid via my Foodler bucks and credit card online, but when I arrived at Temptations they knew nothing about the payment. After a few minutes of explaining my situation I gave them my order# and fortunately they had a number to contact so they could figure out how they were getting paid. I gave them my cell# just in case though! 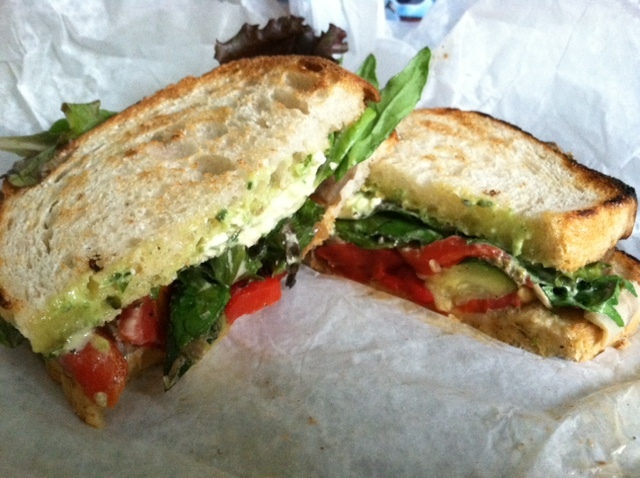 I’m literally obsessed with practically every aspect of this sandwich. It’s beautifully put together, easy to hold without loosing any components, and grilled to perfection! I’ve been a few times now and can’t bring myself to order anything else, which is unfortunate b/c the rest of the menu is equally as ‘tempting’ (southwestern turkey, prosciutto & fig, mushroom & brie). Does someone want to go halvies? Not only can you grab a sandwich to go at Darwins, you can also do some grocery shopping while you’re there; they sell fresh produce, baked goods, beer & wine, snacks of all kinds, and even have a separate cafe serving tea, coffee, and espresso drinks. 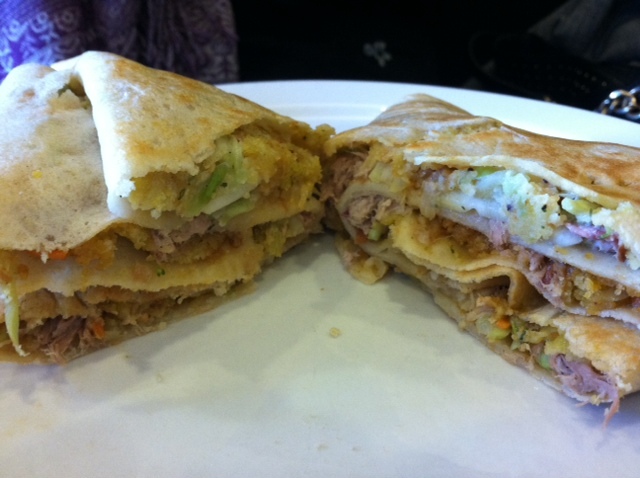 The sandwich menu offers a variety of turkey, tuna, meat, and veggie selections. Condiments and add-ons (which are very important to me) are plentiful with unique options like Sundried Tomato Pesto Mayo, Jamaican Relish, Horseradish Scallion Mayo, Tabouli, Sprouts, different types of mustard etc. 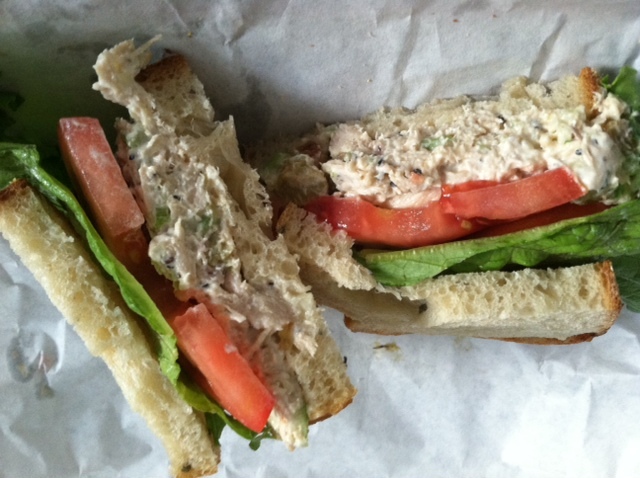 Today I went with a chicken salad sandwich which I rarely order. The golden raisins added a sweet component yet there was still a peppery after taste. They offer about 10 different bread types and I chose the Rosemary-Garlic, which may not have been ideal to pair with this sandwich but I really enjoyed it! 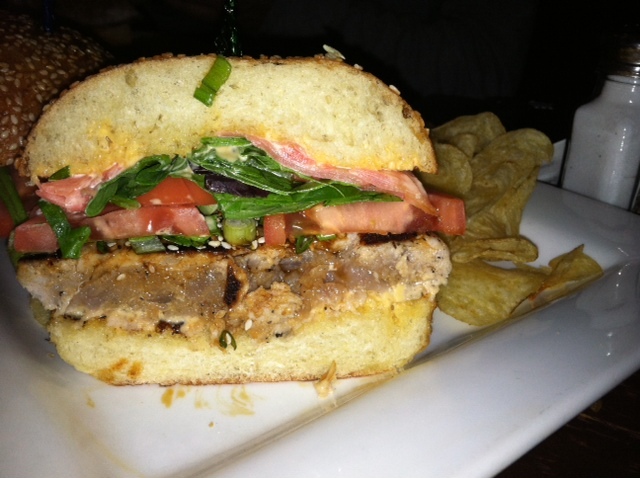 Spicy Tuna Burger: A sashimi grade yellowfin tuna, finely chopped and formed into a patty and grilled to medium rare. Served on a classic seeded burger bun with homemade spicy mayo, thinly sliced pickled ginger, scallions, mixed greens, roma tomatoes, toasted sesame seeds and a kabayaki drizzle. Before entering Parish late Friday night I was commenting/complaining about how they serve intense sandwiches but very rarely change their menu. Well they sure did prove me wrong b/c one look at the menu and I was overwhelmed by all the new options (I guess I haven’t been there in a while!). I split the Spicy Tuna Burger with Erin (as well as the Zunni Roll) and was more than satisfied. Packed with great flavor and fresh ingredients! We had left over chipotle aioli (from the onion rings) that I smeared on each bite (I’m a condiment freak) which made it that much better. This hot spot in Brighton Center attracts locals not only for its coffee drinks but also for the breakfast sandwiches, crepes, and paninis. While the Californian is under the Panini category, I think it’s more appropriate to call it a sandwich. When I think panini I envision grill marks on the bread and a bit less filling, but I can’t deny that it was a tasty sandwich. 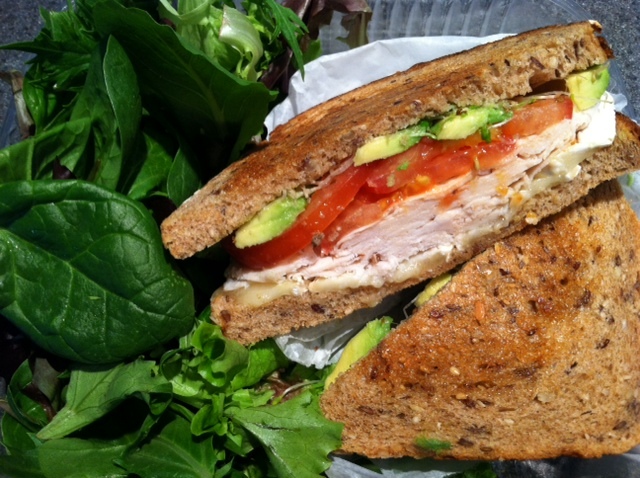 A classic turkey/veggie combo with a punch of brie works for me! I do love my condiments though and wish they had some mustard to throw on there. Refuge Cafe offers breakfast, pastries, lunch, espresso drinks, milkshakes, ice cream, smoothies, and believe it or not, beer on tap. Many of the lunch options were tempting, including the Chipotle Sweet Potato Soup, but today was a sandwich day so I went with the grilled veggie. The bread could have been more toasted/grilled; I ordered the sandwich to go and by the time I got home it was a little soggy from the veggies, but the pesto mayo really made up for it. A bright new spot I’d definitely return to, possibly to try any sandwich that comes on a pretzel bun! I’m not one to love chains, but oh-my-deliciousness, I just adore Cosi. Did they win me over with the warm flatbread samples waiting for me at the register, the creamy tomato soup, or the personal S’mores station? I’m not sure. 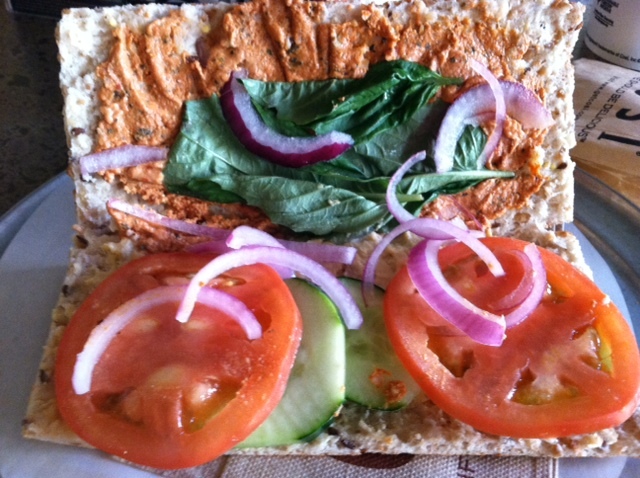 This sandwich is a favorite of mine, and it’s great as is, but I always ask for “1 side with hummus, 1 side with sundried tomato spread.” Next, I’ll attempt to force myself to order a different sandwich (turkey & brie w/ honey mustard!) 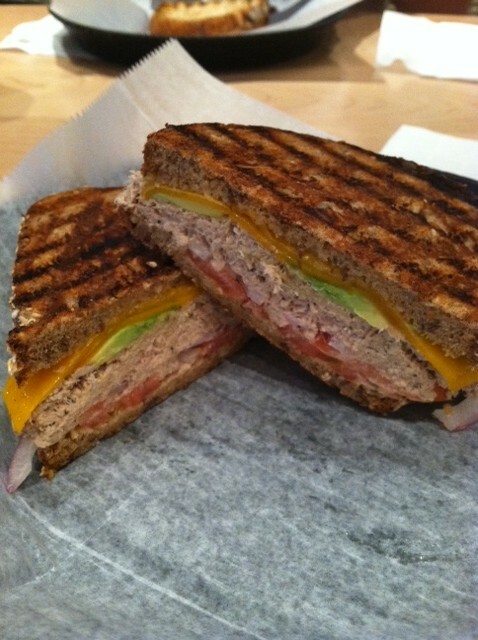 or perhaps a warm melt (mmm, tuna & cheese). You absolutely, positutely, HAVE to go to Wan’s Convenience Store on tremont st (just after parker st) in Mission Hill. The full pound sandwiches are all made by one man, the legendary Al, who will regal you with a story while he cooks you up some magic. Be prepared to wait a little while – he is a man who puts love and time into his food and is not one to be rushed. However, the wait is well worth it. Everything is cooked on a flat grill with his special blends of spices and sauces. My favorites are the Deathwich and the pastrami, but the Hussshhhhhh (whatever he feels like making) is a risk that always pays off well.